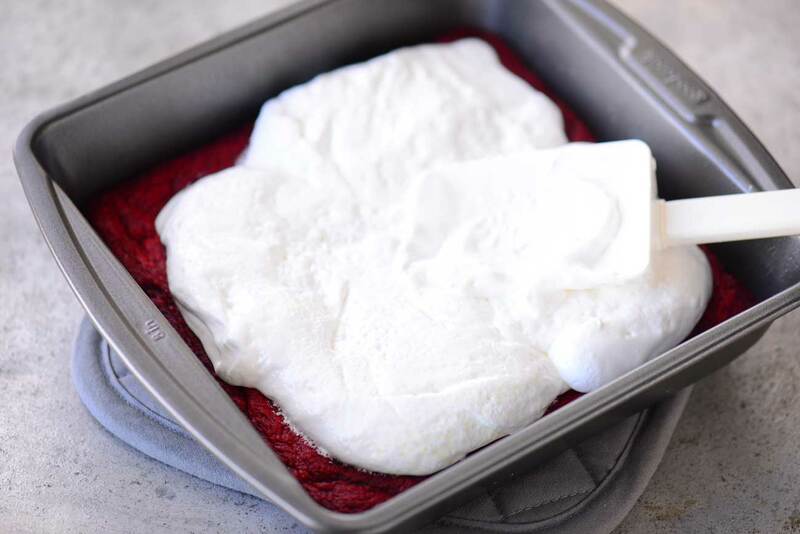 Red Velvet Ooey Gooey Bars have a red velvet cake crust with marshmallow cream and rice krispies treats on top. 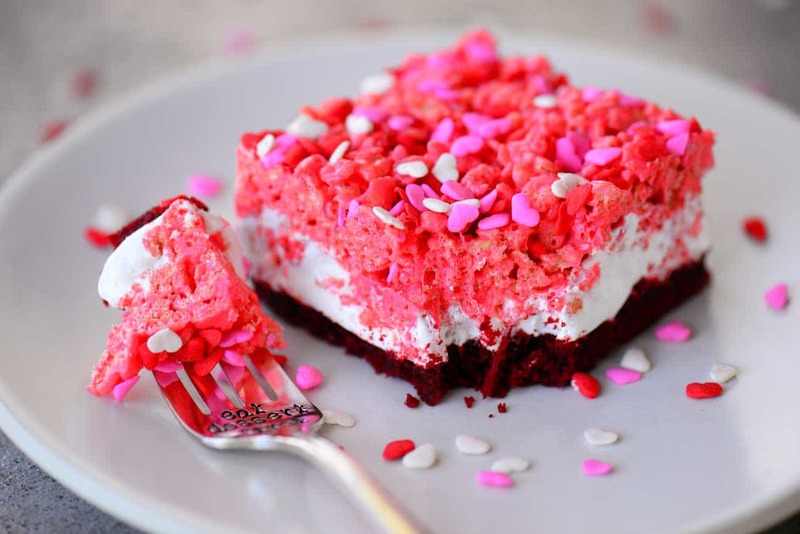 A Valentine’s Day dessert loved by kids of all ages. 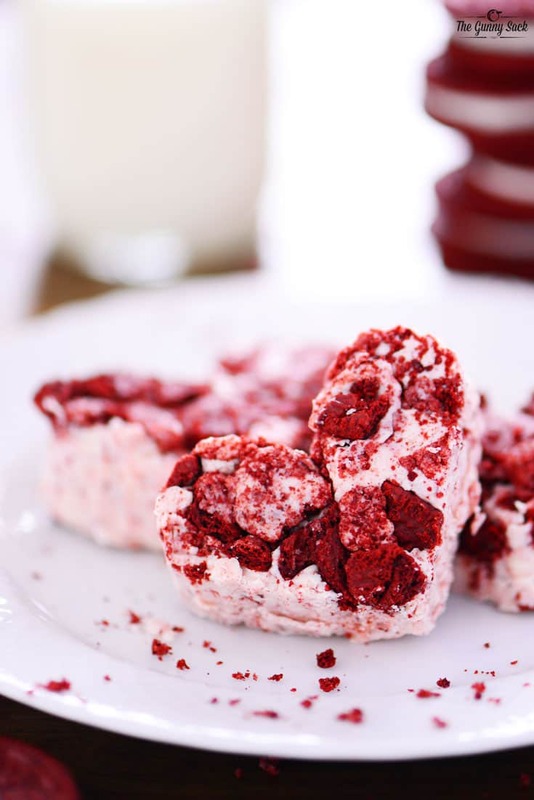 Since Valentine’s Day just around the corner, I decided to make a Red Velvet Gooey Bars recipe. My first gooey bars recipe dates back to 2014 and it is still a family favorite, especially with my son. Something about the combination of the tender cake on the bottom, chewy and crispy rice krispies treats on top and the oozing marshmallow cream in the middle is pretty irresistible! 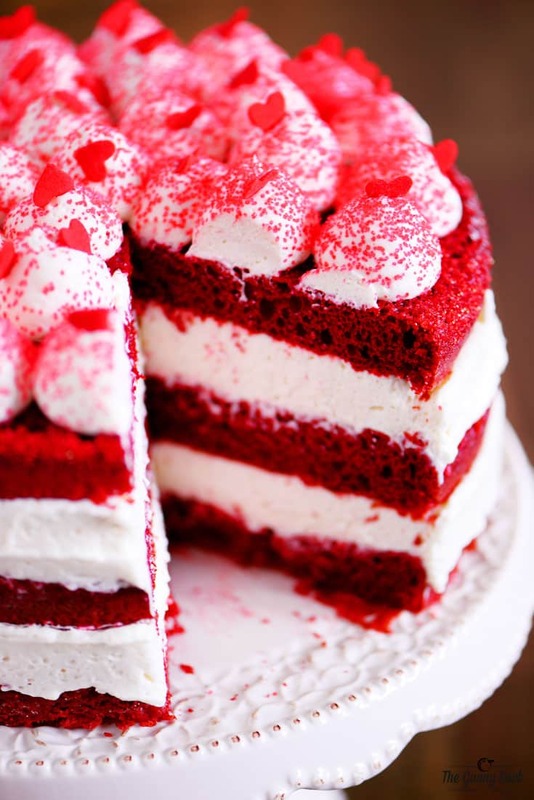 Start by mixing together a red velvet cake mix, vegetable oil, and an egg. Spread this batter in a greased 8-inch square pan. Bake at 350° for 10 to 12 minutes. Remove from the oven and top with a 7-ounce jar of marshmallow cream. Allow the marshmallow cream to melt and soften and then slowly spread it out over the bars with a greased silicone spatula. Next, melt the butter in the microwave. Add mini marshmallows and stir to coat. Melt the marshmallows in the microwave for 45 seconds. Stir until smooth. If necessary, continue microwaving and stirring in 15-second intervals until smooth. 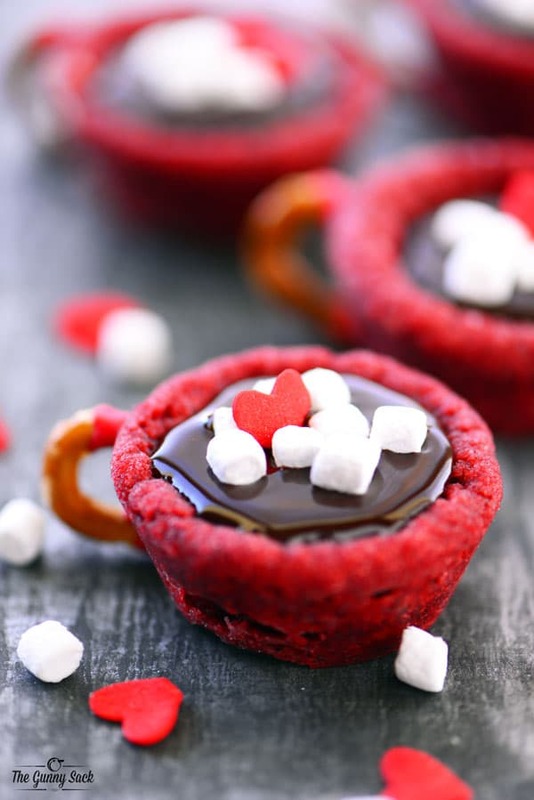 Add red food coloring and stir. Add rice krispies and stir until combined. Scoop rice krispies treats onto the bars and spread out. I find that using my hand in a greased sandwich baggie works well. 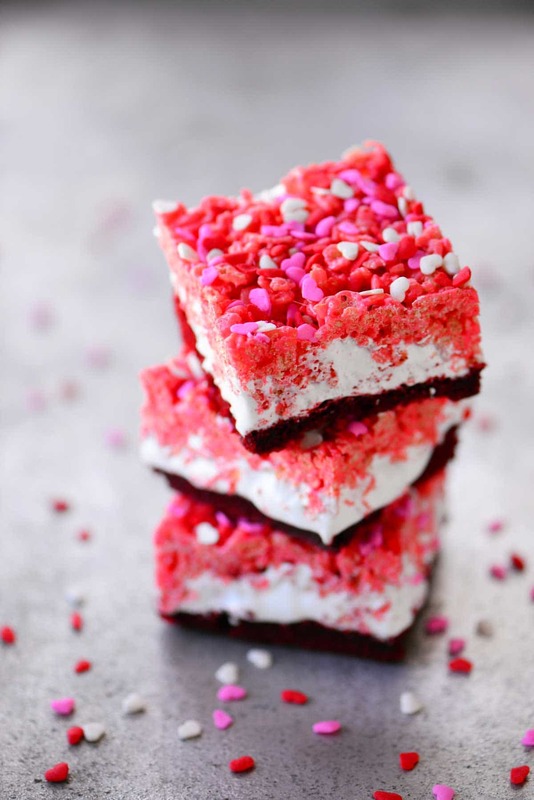 Top the bars with heart shaped sprinkles and gently press them into the rice krispies treats. 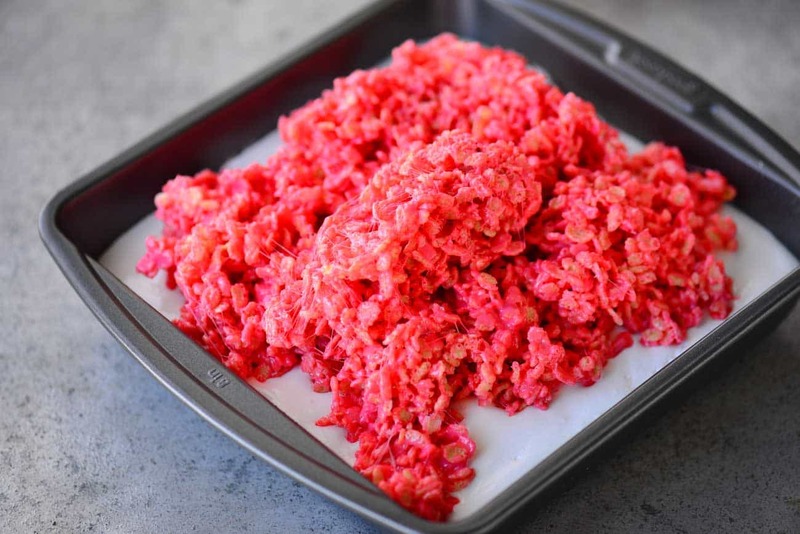 Place the bars in the fridge to chill and harden before cutting into squares. One of my brother in laws tasted ooey gooey bars for the first time when my son requested that I make them for our family Christmas. 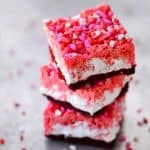 He got to try them again when I made this Red Velvet Ooey Gooey bars version for Valentine’s Day and he can’t say enough good things about them! 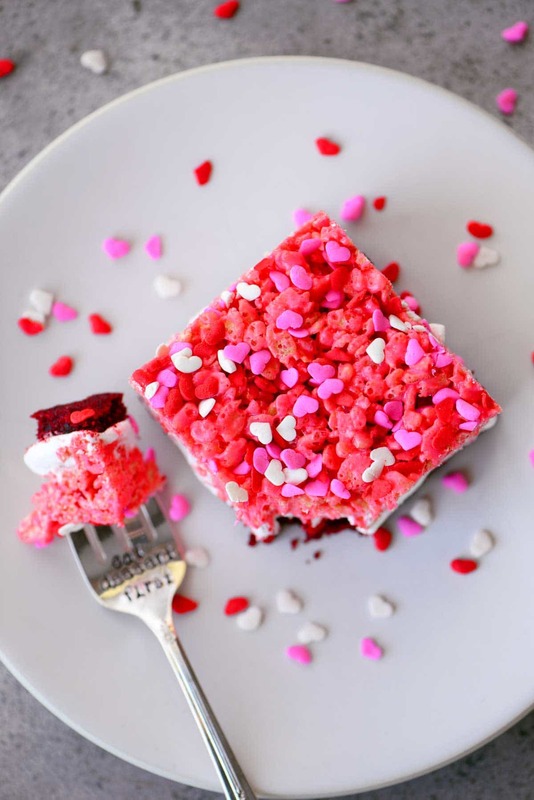 The combination of the soft red velvet cake mix cookie layer with the ooey gooey marshmallow cream and crunchy rice krispies treats and loved by kids of all ages. To make the first layer, mix together cake mix, oil, and egg. Press into greased 8-inch pan. Bake at 350 degrees for 10-12 minutes. For the second layer, remove the cake mix cookie crust layer from the oven and put spoonfuls of the marshmallow cream on top of the hot bars. Allow the marshmallow cream to melt and soften and then slowly spread it out over the bars using a greased spatula. For the top layer, melt the butter in the microwave for about 20 seconds. Add the mini marshmallows and stir to coat. Microwave for 45 seconds and stir until smooth. (If the marshmallows aren’t completely melted, microwave and stir in 15 second intervals until smooth.) Stir in red food coloring or red gel paste. Mix in 3 cups of rice krispies. Scoop rice crispy treats onto the bars and spread out, gently pressing them into the marshmallow cream. Top with sprinkles. 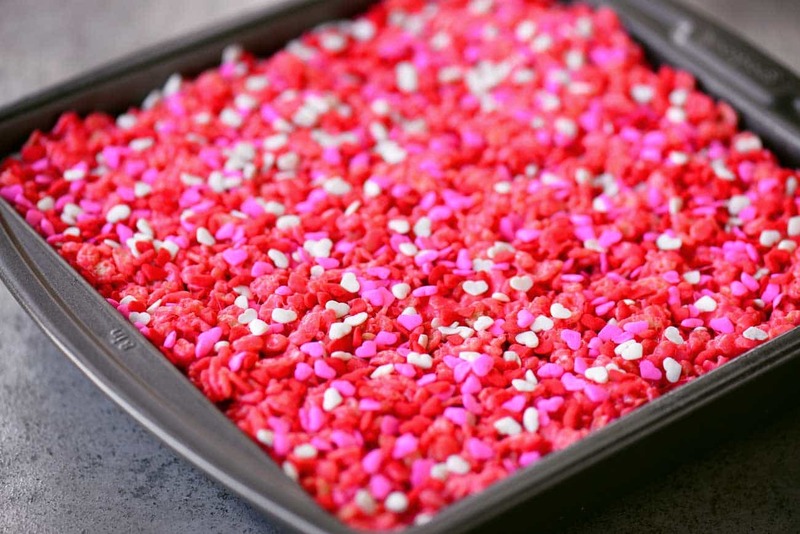 Gently press the sprinkles into the rice krispies treats. Allow the bars to chill and set before cutting them into squares. The Ooey Gooey Bars look so good!! Only this is that I would have to use the whole cake mix for my family!!! The Ooey Gooey Bars look Fantastic. Boy, will my grand kids love these. Only thing is; with my family I would have to use the whole cake mix and put in 9×13 pan or sheet pan.